When Ashland resident and businesswoman Delia Gaia was considering a name for her line of hemp-infused beauty products for women, she turned to a goddess — the ancient Egyptian goddess called Ma’at. It shouldn’t be surprising, because Delia had adopted another goddess’s name, Gaia, the Mother Earth goddess, as her business persona. The Ma’at code of ethics guides Delia’s personal and professional life, so it was fitting that she named her business Ma’at Botanicals and adopted Ma’at’s wings and ostrich feather as the company logo. Delia started the business in 2016 and hopes that by December her online sales will be fully launched in 47 states. Ma’at Botanicals are available in selected dispensaries, at wellness events, on her website and through Etsy. The Ma’at Botanicals line includes body butter, a healing salve and skin ointment, three kinds of herbal teas and bath salts. All of the products are handmade with organic, locally sourced ingredients, and the products are laboratory tested for purity. The creams are made with full-spectrum hemp extract, which means the oil contains all of the plant’s naturally occurring cannabinoids and essential vitamins and minerals. The teas are made with “activated” hemp flowers (CBD compounds are retained during processing), and the soaking salts blend hemp-infused coconut oil, Epsom and Himalayan salts, and lavender. Delia refers to Ma’at Botanicals as a lifestyle brand for women who are committed to, and have fun with, living out Ma’at principles on a daily basis. “Ma’at is a goddess with practical applications,” she said. “I’d like Ma’at to be someplace for women to get inspiration,” she said. Toward that goal, the page features women in leadership roles in the cannabis industry. Ma’at Botanicals not only celebrates strong women, it celebrates the power of cannabis. In fact, Delia pointed out the Egyptians were among the first to use the cannabis plant medicinally. By 2000 B.C.E., cannabis was recommended for a variety of ailments: sore eyes, cataracts, tumors, even sadness and ill temper. Delia’s fascination with cannabis developed as a teenager growing up on a 1,000-acre farm in Pennsylvania. After her granny showed her a handful of tomato seeds, Delia decided to grow a different kind of plant from seeds, and her relationship with cannabis and other herbs has been growing strong ever since. Inspired by her grandmother, Delia studied Western herbalism, which emphasizes European and Native American herbs for healing. 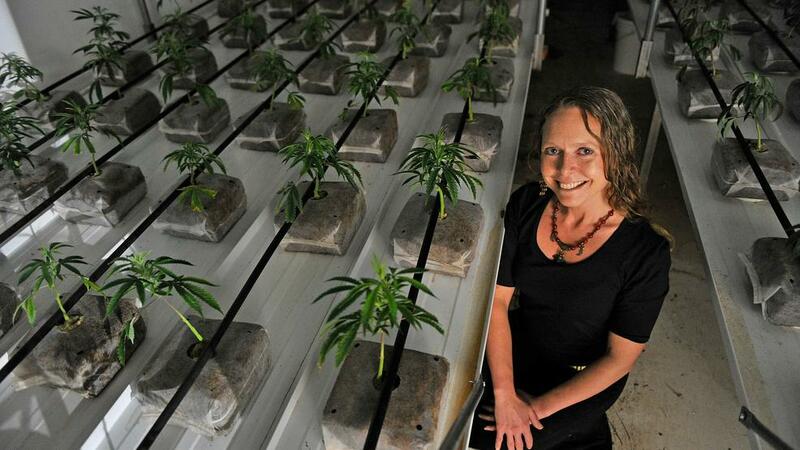 In 2006, Delia and her husband, Lucas Olsen, began growing and packaging medical marijuana in California. Delia also worked as an ambassador for Willie’s Reserve, helping to market a line of cannabis endorsed by singer Willie Nelson. It was Willie’s business model and his brand reputation for integrity that made the most lasting impressions on Delia. “Integrity is so important in the cannabis industry,” Delia said. Delia and Lucas moved to Ashland 10 years ago and have found it an ideal place to raise their 6-year-old son, Osiris. After they arrived in Southern Oregon, the couple started a glass pipe business called Dichroic Alchemy (dichroic is a type of glass that displays two different colors by changing in certain lighting). A student of the Nosara Yoga Institute in Costa Rica, Delia is also a yoga retreat facilitator, and she’s an active community advocate for cannabis. She started the Southern Oregon chapter of Women Grow in 2016. Lucas established Sovereign Distribution in Talent and then The Factory in Ashland (www.thethcfactory.com). Today The Factory grows, packages and distributes several indoor- and outdoor-grown indicas and sativas for recreational and medical use. Some of the marijuana grown at The Factory is packaged in tamper-proof, sealed containers, designed by Lucas, that promise to seal in product freshness at the perfect cure. Other canisters of cannabis are sold to Siskiyou Medical Supply in Ashland, The Greener Side dispensary in Eugene, and Oregon’s Finest dispensary in Portland. Ma’at Botanicals grew out of Delia’s desire for “something tangible and women-centric” to call her own. She loves that the business allows her to “explore cannabis so thoroughly, to connect with people and help eliminate the stigma of cannabis.” She also relishes the opportunity to give back to a plant that has long provided for others in abundance. Surely the goddess Ma’at would be pleased.